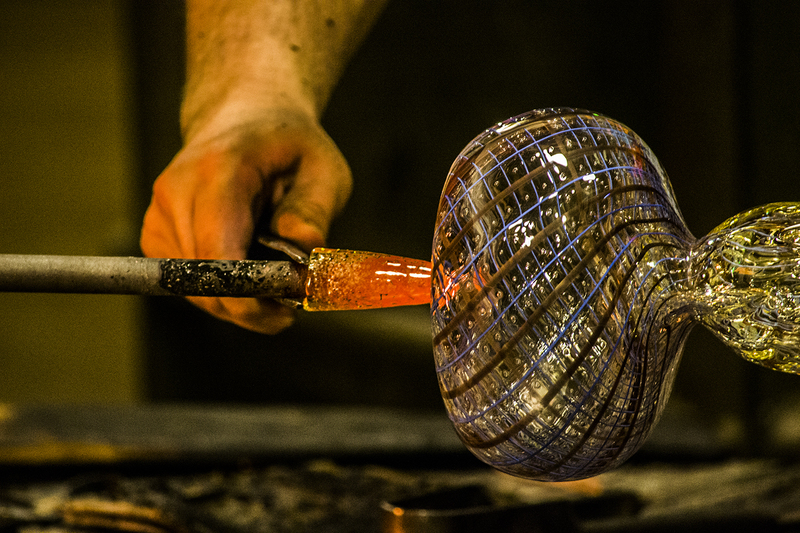 I’ve decided to write a series about what glassblowing has taught me over the years. I’m going to start with, basically, ‘dealing with failure.’ Because, if anything teaches you about how to fail with a smile and try again, it’s glassblowing. This is a reticello. Well, my first version thereof. 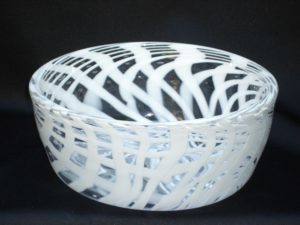 To make a bowl like this, a glassblower must create two cups, then interlace the exterior of one with the interior of the other, causing both a ‘lattice’ pattern of color and a pattern of small bubbles between the two layers. The steps are somewhat complicated from Point A to Point Z. And here’s where I get to the meat of things: I was originally completely clueless about what was going wrong. 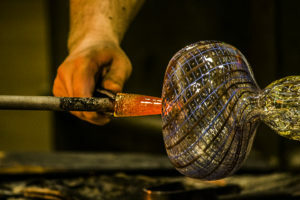 Even under the direction of a true master of the craft, who had owned his own studio and blown glass since 15 or 16, I couldn’t really hold all the core information I needed to understand why things were going wrong. 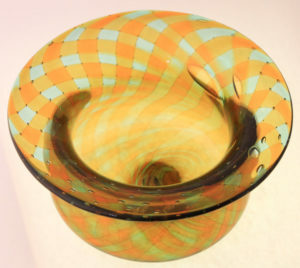 One can only focus on so many things at a time, and the holes between, “Keep this on center” – a somewhat difficult task for a beginner – and, “Do not marver this so much you cool down the core of the canes but marver it enough to close the holes in the sides of the cane pickup and twist the ribs,” is wide. If your focus is on the basics for long enough that they become second nature, you can begin to approach intermediate and advanced tasks without worrying about them. Thus when you are completely mystified about the introductory and intermediate portions of any task – be it algebra or tumbler-making or an L-based folded leaf or circuit design or differential equations – it’s a good thing. 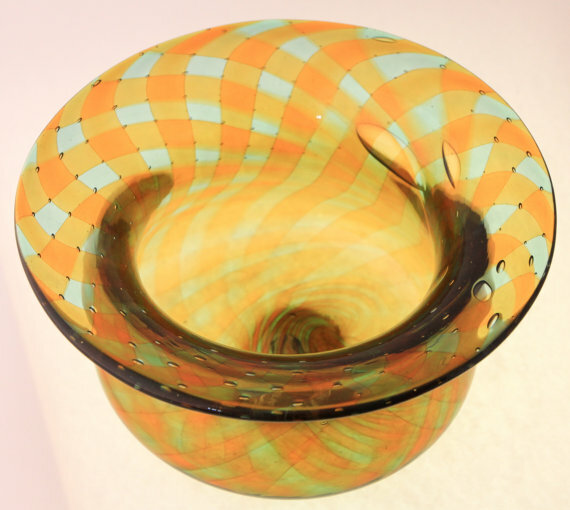 And if you learn to perfect a task, digging into the specifics of how to make a twisty cup or massive Structured Query Language join work perfectly, you can make something new. I’m proud of this bowl, for example, but still see a whole lot of room for improvement. Wow, fantastic blog format! How lengthy have you been blogging for? you make running a blog glance easy. The total look of your web site is great, as neatly as the content! Hurrah! After all I got a web site from where I be capable of in fact obtain helpful information regarding my study and knowledge. Aw, this was a really nice post. In thought I would like to put in writing like this additionally â€“ taking time and actual effort to make a very good articleâ€¦ but what can I sayâ€¦ I procrastinate alot and certainly not appear to get something done. Fantastic, great items guy. Now i am an avid fan. Keep it up. 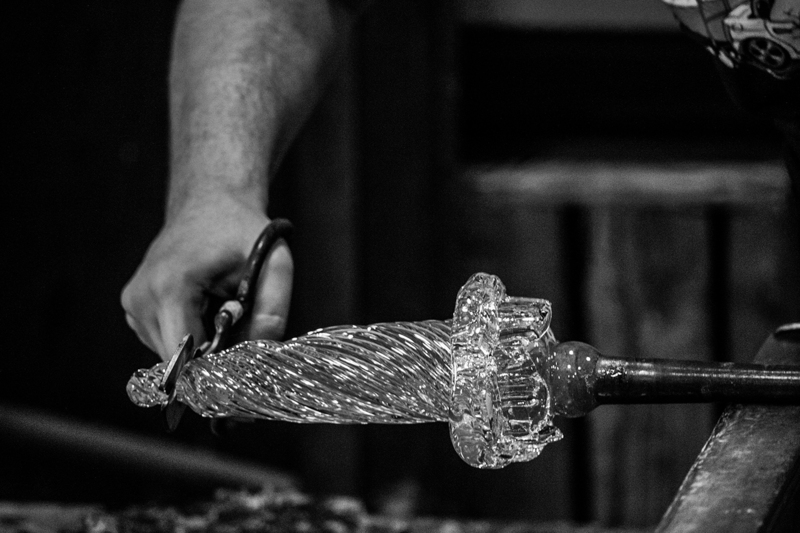 you wouldn’t happen to have an e-mail class to teach me how to blow glass for a certain cost?